Explore some of North and South India's best wildlife paradises! Marvel at the birds of Kumarakom and Bharatpur, keep an eye out for the rare Nilgiri Tahrs of Eravikulam and watch the Elephants of Periyar! Round off your Indian adventure with a visit to the magnificent Taj Mahal and a scenic backwaters houseboat cruise! Your Indian wildlife photography tour begins on arrival at Delhi Airport where you will be welcomed by our representative and transferred to your hotel. We advise you to get adequate rest today, as tomorrow marks the beginning of an unforgettable adventure! Delhi, the capital city of India, is one of the largest and fastest growing metropolis in the world. It is a bustling city, ever growing and molding itself with the times.The city has a colorful history which is embodied in its monuments, forts and historical places. A visitor can choose to sample the culture of the city in its vibrant markets or taste the Indian cuisine in its numerous eateries. Delhi has something to offer for everyone! Today after breakfast, we leave the Indian capital city and drive for approx. 4 hours to Agra, where we will stop for lunch. This will be followed by a visit to the magnificent Taj Mahal. It’s architectural splendor is a vivid reminder of the legendary Mughal Empire and a symbol of Emperor Shahjahan’s love for his wife. We then drive for approx. another hour to our first wildlife destination- Keoladeo National Park (formerly Bharatpur Bird Sanctuary). After checking in at the hotel, you are free to spend the remainder of the evening relaxing. We have the opportunity of exploring the Keoladeo National Park over the next two days. We leave early in the morning at dawn for birdwatching in Keoladeo National Park. Dawn is the best time to spot birds, which are out in large numbers in the morning sun. The ample sunlight is also a photographer’s delight. Afterwards we return to the lodge for breakfast. You are free until after lunch, when we will set out once again to explore the area. Keoladeo, as you may soon discover, is a birdwatcher’s paradise. It is regarded as one of the finest bird sanctuaries in Asia and is home to about 375 types of birds. In winter, one can see many migratory species from the northern hemisphere, including the famed and rare Siberian Crane. Keoladeo is also a UNESCOWorld Heritage Site. It can be explored using a quaint rickshaw, on foot and by boat. After breakfast, we bid goodbye to Keoladeo and drive for about 5 hours to Delhi airport to take our Indian wildlife tour to Kochi via flight. Our representative will meet you at Kochi airport and help you get to your hotel. Today after breakfast, we travel to Munnar (approx 4.5 hours drive), where we will spend the next two days. Munnar is a beautiful hill station and a major center of Kerala’s tea industry. The town is surrounded by about 30 sprawling tea estates where these precious leaves are picked, dried and processed into top quality tea. After check-in at the hotel in Munnar, you are free to spend the rest of the day relaxing and soaking in the rejuvenating climate of the town. Today we plan to spend the day at Eravikulam National Park and leave for the park in the morning (picnic lunch will be carried along). As vehicles are not allowed inside, we will exploreEravikulam National Park on a nature walk. We return to our hotel in the evening for dinner. 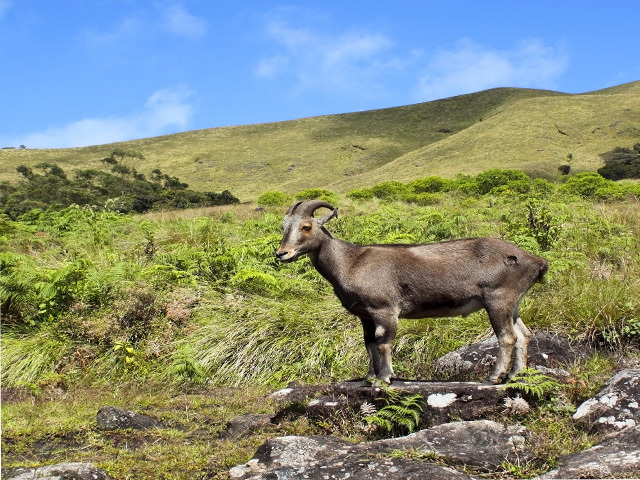 Eravikulam was established to protect the Nilgiri Tahr, an endangered species of mountain goat. It is the only mountain goat species found south of the Himalayas. Sure-footed herds of Tahr are quite elusive, but you may be able to get a good view of them as they graze through the hillside vegetation. Eravikulam is also a habitat for a variety of mammals that include the Nilgiri Langur, Lion-tailed Macaque and several endemic bird species such as the streaky brown Nilgiri Pipit and Blackbird. The Blackbird in particular looks very different from the familiar songster of Europe and is regarded by some taxonomists as a possible separate species. Today, after breakfast we embark on a three hour drive to reach Periyar National Park. 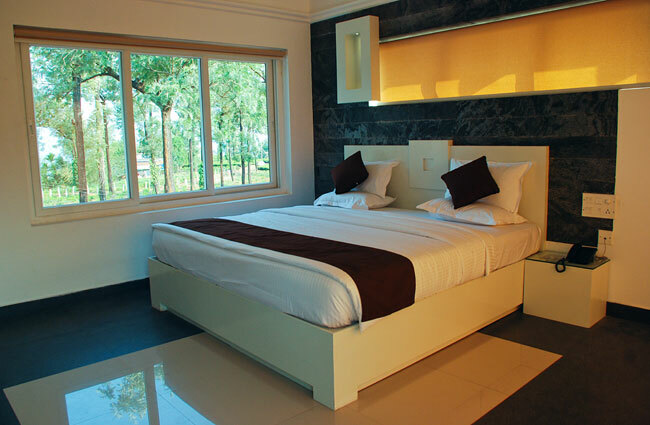 We stay at the Aranya Niwas Hotel located inside Periyar Tiger Reserve in the Cardamom Hills. After lunch, we will visit a spice garden in the area. We return to the hotel at dusk and you can relax for the rest of the evening. 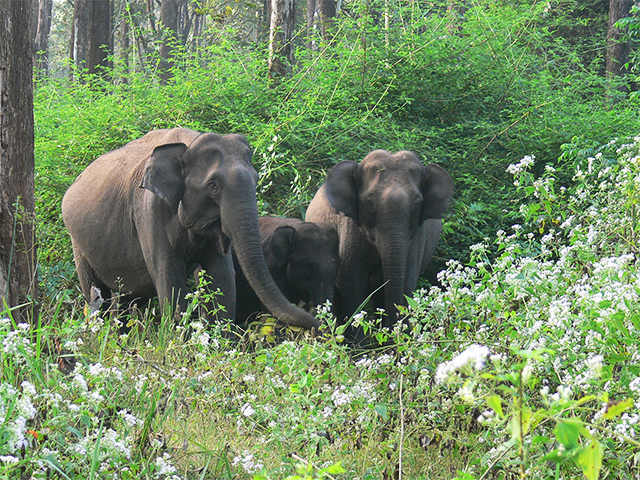 Today we begin the day early with an elephant safari in Periyar National Park. We return to the lodge for breakfast. You can relax till it is time for a guided nature walk into Periyar. One can observe the plants and insect life which are usually ignored during a jeep ride or safari. Our exploration of Periyar will end at dusk, and we return to the hotel for dinner. Today we go on a morning boat ride on the Periyar Lake. You might see Elephants grazing the grass at the water’s edge or bathing in the shallows. You may also spot Indian Bison, Sambhar Deer, Wild Boar and Otters. Keep an eye out for Flamingos too! We return to the lodge for breakfast. We will then head out for a short nature walk till it is time for lunch. You can spend the rest of the day relaxing or exploring the hotel surroundings. Today we go on an early morning boat ride hoping to sight wild animals at the lakeside. After breakfast, we head for our next wildlife destination- Kumarakom Bird Sanctuary (approx 4.5 hours drive). On reaching the little tourist village of Kumarakom, we check-in to our resort and have lunch. After lunch, we take a five minute boat ride and walk a short distance to get to the bird sanctuary. In the late afternoons, large numbers of Herons and Egrets fly in to roost here, so you could be in for a treat as soon as you enter! The sanctuary is a photographers delight and one can spot several species of birds in the area. We end our exploration at dusk, and return to the resort for dinner. Situated in the backwaters of Kerala, Kumarakom Bird sanctuary is an ornithologist’s paradise. The main attractions here are local birds like the Cuckoo, Owl, Cormorant, Moorhen, Darter, Brahminy Kite and Duck, as well as the migratory Siberian Crane. Parrot, Teal, Lark and Flycatcher are some of the common birds. Some of Kumarakom’s migratory birds come from the Himalayas, and a few from as far away as Siberia. Get ready to experience God’s Own Country in a whole new way as we board a houseboat, locally known as ‘kettuvalloms’ for a cruise to Alappuzha (also called Allepey). 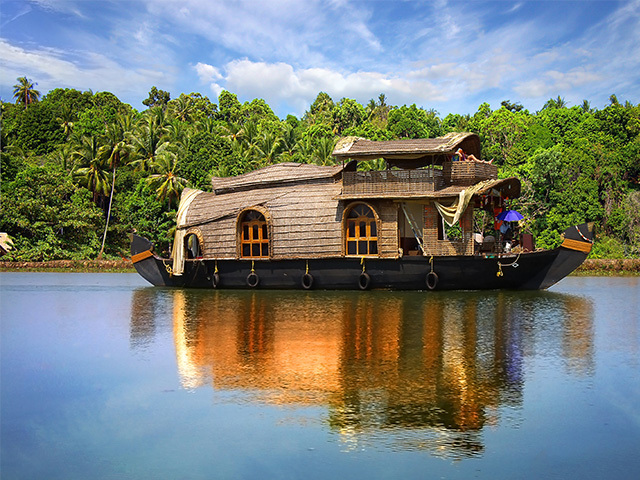 Savor the beauty of the landscape as we drift along the narrow canals and paddy fields of the scenic backwaters. At Alappuzha, we leave the houseboat in the morning after breakfast and drive to Kochi (formerly Cochin). You may enjoy the rest of the day exploring Kochi. Kochi is the spice capital of India and a major port city. It was the first European colony and has been colonized by the Portuguese, Dutch and British. The remnants of the colonizers can be seen in the architecture at Bolghatty Palace, Dutch palace, Jewish synagogue, Chinese fishing nets and many more. This is the last day of the exciting North and South India holiday, which took us across bird sanctuaries and national parks. You can relax till it is time to head for the airport to board your flight back home, or to Delhi in case you have an international flight.